Click either image for larger version. 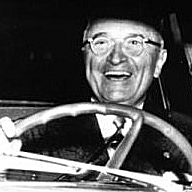 "After President Eisenhower was inaugurated, Harry and Bess drove home to Missouri by themselves. There was no Secret Service following them." -Lulac Political Letter blog (source for Bess & Harry Truman photo).